Anticorrosion Design of main machine: Stainless steel 304 cover, component circuit are isolated with cooling air passage (The upper layer is electric components circuit, it is hermetic, the lower layer is cooling air passage), effective on anticorrosion of electric components by corrosive gas, so it can increase machine’s reliability and working life, especially suitable for pesticide factory high corrosion area using. Output voltage stable: When power supply fluctuate or load change strong, system will automatic stabilize output voltage of heating head, it won’t be too high and too low or suddenly high and suddenly low, ensure sealing results are uniform, avoid undesirable bottle sealing. Stability and Reliability: It has special designed self-diagnostic and self-protection system, when over heat, over load, water shortage or power supply abnormal, it can self-protection timely, at the same time, offer sound-light alarm, so easy to know fault position accurately and help user check and trouble-shooting. Water Tank: It is used to offer circulating cooling water, real-time monitoring water-flow and water temperature, digital display water flow capacity and water temperature alternatively and alarm on fault (Water shortage or over heat) and self-diagnostic, ensure main machine and heating head working secular stability. 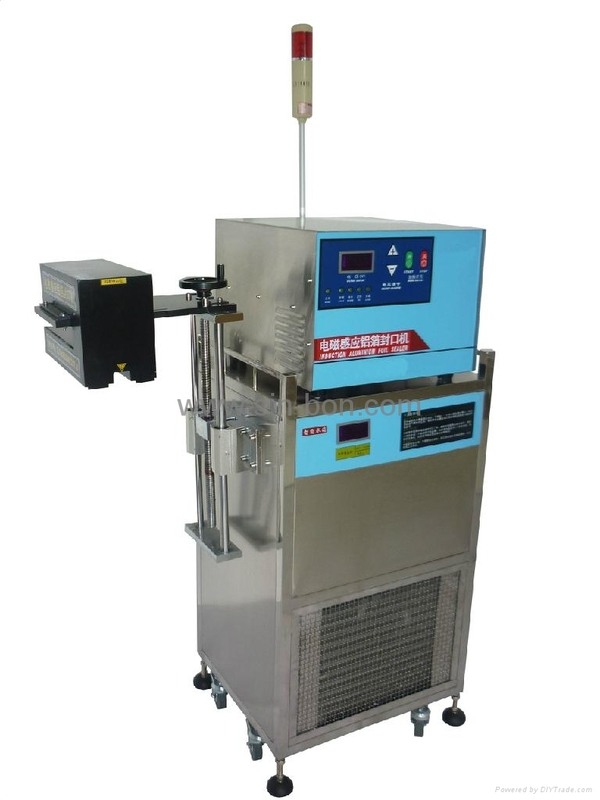 Newly designed the best combination property water cooling induction sealing machine in 2011, it overcome sealing bottle diameter problems, which small bottle mouth and big bottle mouth cannot be compatible in one machine, running stable and suitable sealing requirements in different sized enterprises. Used to seal bottle and suitable for complicated-shape bottle sealing too.